I have had dogs my entire life. However, the first two weeks after my girlfriend and I had moved out to California together were also the first two weeks of my life without the responsibility of a dog. Between our financial situation and the fact that we moved out by train, I had to give away my dog, who is now as happy as can be, to my college roommate. But, now 3,000 miles away from home, I was certainly feeling like I was missing a furry companion in my life. After this time on the West Coast, with no house and no jobs, we were driving a relative’s car back north from Los Angeles after a birthday weekend, traveling through typical 9 a.m. traffic on a four-lane highway. There, I saw what looked like a deer trying to cross the road at the divider, before almost getting hit, honked at, and passed around without a second thought. As we got closer and we almost hit it ourselves, I quickly realized it was, in fact, a dog, who looked scared for her life. Without any words being exchanged between my girlfriend and I, I pulled around this dog and cut off two lanes. I opened our door and got down really low, and she ran right up to kiss me. Within 10 minutes on an uncomfortable back seat, she had passed out from shock and relief. Not long after, we tracked down her old owner, who gave us an excuse that was like something parents would use to explain where their old family dog had gone. He claimed he had to give her to his buddy to take to his ranch up north. After playing along just long enough to get her paperwork, we brought her to the vet, who told us that her injuries were most likely sustained from dog fighting. She was probably discarded for being too nice, and she had been out there for at least a few days, starving, thirsty, and trying to survive. When we found her, she had a large, deep dog bite extending from her back around to her throat, along with several injuries from being clipped by cars. Despite our living situation, we did everything we possibly could to try to keep Cali with us, but it was proving to be far more difficult than we had anticipated. After committing to vet bills and being set on keeping a dog, the job and house hunts all without a car began to strain our journey together, so we were forced to make the only decision we could at the time and gave her to the best local shelter we could find. Even after we spent such a short amount of time together, it was the hardest thing I have ever had to do. I had never felt such a connection to an animal. Two months had gone by, and we were finally settled with jobs and a place, one that sadly didn’t allow dogs, but not a day went by that I didn’t think about where Cali had ended up. One Tuesday when I was cleaning out my wallet after work, I came across a card with the shelter’s number on it. I figured why not call, as it had been long enough, and I would get the closure of making sure she went to a good home. As it turned out, I called 30 minutes after the second family had returned Cali back to the shelter – neither the lady on the other end of the phone nor I could believe it. So, I rented a car the next day and drove 10 hours round-trip to adopt her. The first woman to adopt her was an older lady who couldn’t keep up with the energy that Cali had required every day. The second was a young couple that expected a rescue dog to be potty trained and weren’t prepared to put the time into training her. It didn’t matter that our apartment didn’t allow pets. We were going to make it work this time. It was meant to be. A few months later, missing our beautiful home state of Vermont, we set off back east with Cali along for the journey. After getting to know Cali, my girlfriend and I developed this theory that she knew very well what was going on, and was purposely acting out with the families that had adopted her, just to wait for us. 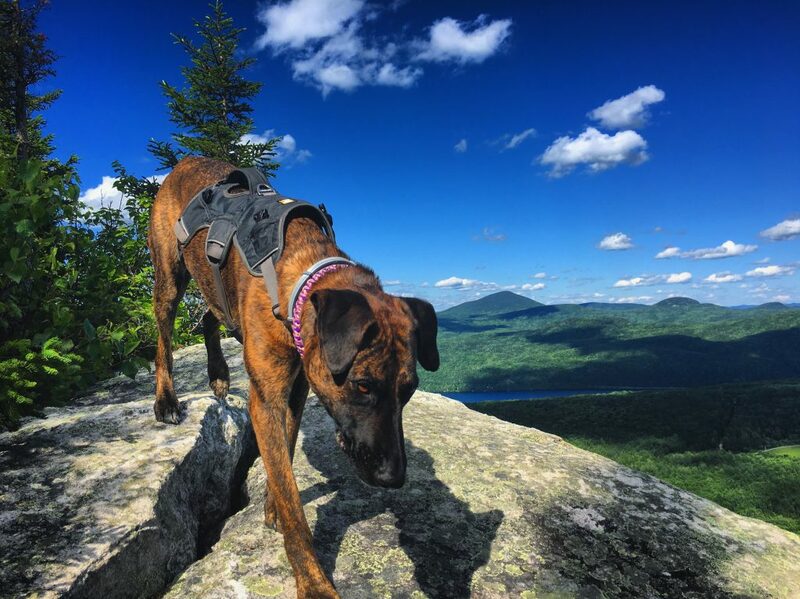 Cali is a Tennessee Treeing Brindle, a Tree Hound variety: She loves running animals up trees and is most at peace in nature. The instinctual stoic pose she makes is her expressing the passion for where she is and what she is doing. After we adopted her for good, we would spend each morning taking her to the open fields, where she could play fetch and run, or we would take her on long hikes through the redwood forests. 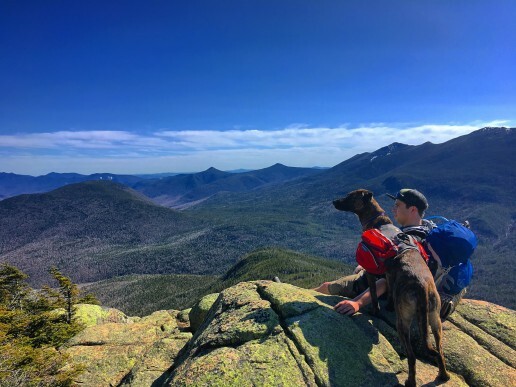 She now regularly takes backpacking trips with me in the White Mountains, and is the perfect hiking partner, either staying right by my side or actively checking on me when she does hike ahead. Cali loves the outdoors. Sometimes when you look at a rescue dog, you can see anxiety in their eyes, and with Cali, that completely disappears in nature. She loves anything outside: playing on the beach, swimming in water, and, most of all, running. In fact, she could run all day long if we let her. 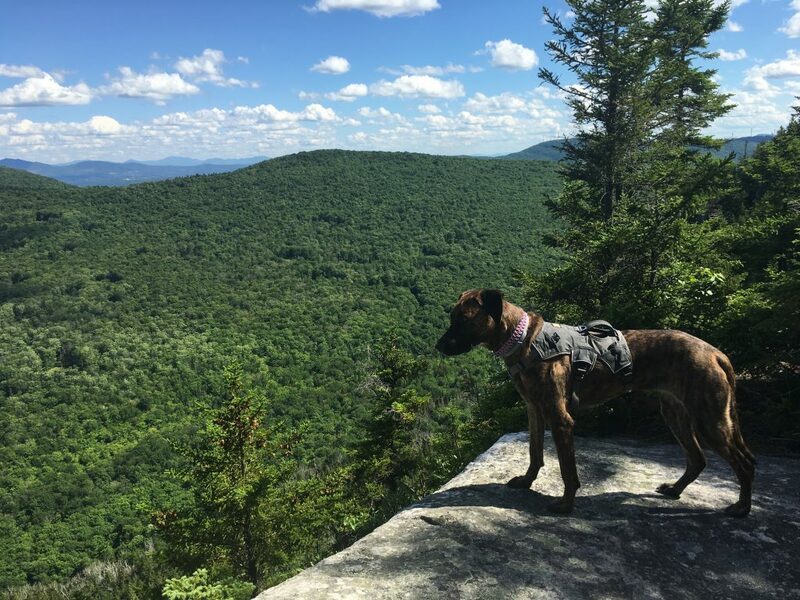 Since being back east, I’ve been training her for the Appalachian Trail next spring…or she’s training me. Right now, she is in better better shape than I am. I could list off a million-and-one reasons Cali is special, but it’s her expressiveness that sets her apart. Throughout my entire life, with all the household pets I have had the pleasure of caring for, I have never never met an animal that feels and expresses her emotions so deeply. It is as if she never had a puppy-hood, so when she plays and gets excited, she comes off as goofy or awkward and can’t fully express her complex feelings. But she will definitely try to in any way she can. She is a survivor. You can tell by looking into her eyes that, because of everything she has been through, she wakes up every morning and finishes every day with huge smile on her face. And, that outlook on life, despite the negativity that had consumed her every day until we crossed paths, is inspiring me. She won’t let a moment pass where she won’t let you know how grateful she is to be where she is today.